Aluminum is extremely useful, thanks to its light weight, malleability and corrosion-resistant makeup. Home-based crafters looking to melt down their old aluminum cans can remold them into ornaments, cookware, containers, custom trim for automobiles and original pieces of jewelry. This project, when undertaken with caution, provides a great resource for aspiring metal-smiths who also wish to conserve and recycle household materials. Find an area to work in that's clean and well ventilated. Place your kiln on the floor and plug it in. Set up a work table on a flat, sturdy surface near the kiln where you can place your tools, cans, molds and safety equipment. Place a piece of sheet metal on the table as well. Place as many aluminum cans as you desire into the steel crucible. 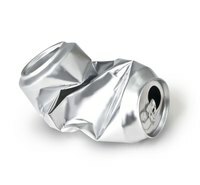 Forty cans will yield approximately 1 pound of aluminum. It doesn't matter if the cans are crushed, dirty or still have some soda inside them. Place the crucible stuffed with cans inside the electric kiln and close the lid. Turn on the kiln's power. Set the temperature gauge on the kiln to reach 1,220 degrees Fahrenheit. This is the temperature needed to liquify aluminum. It may take up to an hour, but once the kiln reaches 1,220 degrees, the cans will melt almost instantly. Wait 20 to 30 seconds to ensure the cans are fully liquified. Put on your heat-resistant gloves and safety glasses. Then open the kiln and pull out the crucible slowly, using steel tongs. Never place your hand inside the kiln while it's hot. Carefully hold the crucible over the sheet metal in case anything spills out. Pour the liquid metal into any mold you wish, as long as its made from metal with a significant resistance to heat, such as steel or iron. Allow 15 minutes for the aluminum to fully cool down and harden. To cool the metal even faster, place it in a bucket of ice cold water after five minutes. After you have drained all the molten aluminum from the crucible, pick it up with your tongs and bang it upside down on a concrete slab to remove the dregs that did not liquefy. You can now fill the crucible with more cans. Continue the melting and pouring process until you've melted enough aluminum to complete your project. When you are finished, be sure to power down the kiln.